We first got a glimpse of Bugatti’s eye-popping Chiron at at a number of car shows and through slick videos showing what it can do. And yes, up close and personal, it is every bit the specimen of a car that it appears to be in its glossy high-res images circulating the web. Now for a model that was originally introduced in a room of concept cars as a vehicle for the future, Chiron has made good on its promise to take to the streets. 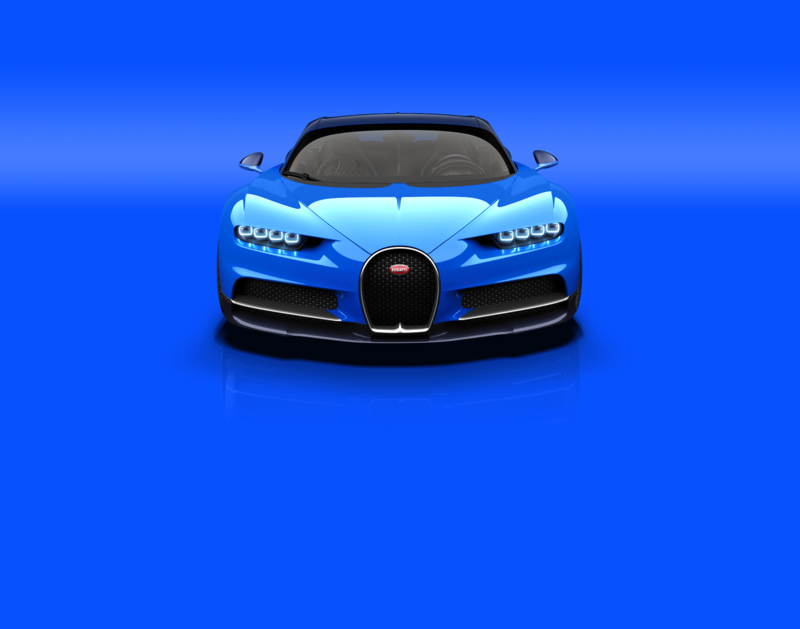 The Chiron according to Bugatti is the world’s fastest and most powerful car that is legal for the road. What does that mean? It means the souped up luxury sports vehicle tops out at about 261 miles per hour without breaking a sweat or grinding its gears. It also means that the car lovers of the world with a Visa Black card will be lining up to add this baby to their garage. Ronaldo? Messi? Where you at? 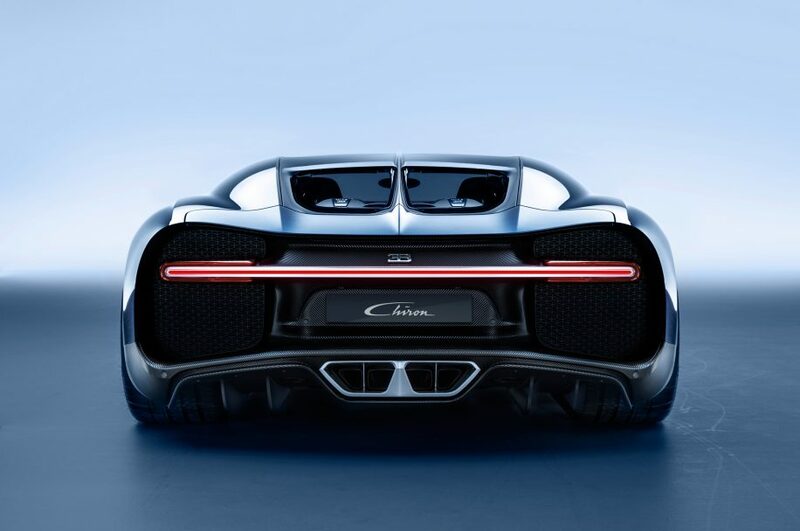 The Bugatti Chiron rear. Photo courtesy of Bugatti. The Bugatti clocks in with a number of bells and whistles you won’t find on the street. Perhaps it sounds more like the kind of speedster one expects to see at F1. But this isn’t F1. Weighing in at 4400 pounds, the hefty Chiron balances out with its low to the ground center of gravity and its sleek aerodynamic silhouette. The fine folks at Bugatti also reimagined the W1 engine that was the stuff of legend in Chiron’s predecessors. Here in this incarnation it boasts 25% more efficiency with its 8 liters of displacement, 4 turbochargers, 16 cylinders, and 1500 Horsepower. It generates up to 1103 kW from the 8 liter displacement and the 4 turbochargers max out at 2000 rpm of torque. As for the speed issue, Bugatti could have gone even faster. But the manufacturer pumped the breaks at a respectable 261 miles per hour. But it continues to warp through the car show circuit, having equally turned heads at the Geneva Motor Show much in the same mouth-gaping fashion it did in Paris. The Bugatti Chiron interior. Photo courtesy of Bugatti. Where does the Chiron fit in the Bugatti chronology? It succeeds the Veyron which in its own right is as much a thing of beauty as the Chiron. And like the Veyron, the Chiron is a 2 seater with a plush interior and technological bells and whistles to make fanboys geek out to. The Volkswagen Group pulls no punches here. While they’ve got a mountain of scandal to climb with their signature vehicle Volkswagen, Bugatti enjoys a bit of a Cinderella story as the belle of the motor show ball. The Chiron retails for $2.6 million. And even if you have the spare change laying around to purchase one of the supercars, you’ll have to be quick about doing so. Only 500 models will be built worldwide. And already 166 have been ordered by customers getting the jump on the rest of the market. According to the CEO Wolfgang Durheimer, customers paid a modest $250,000 deposit to guarantee their set of keys. One customer even ordered 6 Chirons to round out the garage collection. Durheimer confides that he and Bugatti are not cowed by Volkswagen’s problems and assures that the Chiron “produces more money than it will cost.” You’ll probably see the Chiron with its low headlights and strip of LED lights blazing through the night at the top of 2017, its high-powered engine growling its signature growl as it whips by.